"During the past two years it has been my duty, which was extremely painful to me, to ask for the resignation of three members of the Board of Trustees. It is need­less for me to go into details as to my reasons for taking these heroic measures, but I wish to assure you that I did it to retain my own self-respect. My conscience fully justifies me in the course I pursued, and I sincerely and religiously believe that the one great Supreme Power that governs us all has approved of my action; and I have declared to you this action on my part for the purpose of saying that not one of the above Trus­tees alluded to, whose resignationts were asked for and accepted, can ever in the future be re-instated as a Trustee of the Leland Stanford Junior University." "Her common sense is her most marked characteristic," remarked a friend who had known Mrs. Stanford for thirty years. "It is a check on her affections and guides her always." Another equally distinguishing trait that is now remarked is her loyalty to the dead, to carrying out the ideas of her son and of her husband. Her independence of judgment is subordinated to their ex­pressed ideas. "I am merely carrying out the intentions of my beloved husband and doing what he would have done had I been first called hence, and he remained here alone," she said to the university trustees when she gave them, in May last, $10,000,­000 worth of property. The manner of this woman who helped in the making of a fortune of $20,000,000 or more, is quiet and unostentatious. She likes to help others, and since her son's death some of her nieces or nephews have been of the household. She is fond of reading, chiefly of philosophical or religious works. She believes in advanced education for wo­men, but is unshaken in her idea that home­making is a woman's highest calling. She likes to talk of the days when she and her husband started on their wedded life; how she cooked his meals and took boarders, and helped in many frugal ways. She believes in economy and thinks it should be taught col­lege students. "A student," said she, recently, "will be better fitted to battle with the trials and tribulations of life if he has been taught the worth of money, the necessity of saving and of overcoming a desire to imitate those who are better off in this world's goods. For, when he has learned how to save and how to control inordinate desires, he will be relatively rich." To many so-called "advanced" women Mrs. Stanford has given her sympathy and friendship. She believes that women should have voice in the protection of their prop­erty, yet she has never been outspoken in aiding the movement for woman suffrage. With Mrs. Benjamin Harrison and Mrs. U. S. Grant she has had enduring friend­ships. The late Miss Frances Willard and she were devoted friends. She is enthusiastic concerning the value of the kindergarten, and several years ago she gave $100,000 to the kindergartens of San Francisco. She believes in temperance, but not in total abstinence; she uses California wines on her table, often those made in her own cellars from the vineyards of the great Vina Ranch. She believes in the worth of good lineage, and has pride in her membership in the Daughters of the American Revolution. She has many ancestors of heroic fighting stock, and her kin include the Sherman, Scudder, Hyde, Mowry, Houghton, Calkins, Bliss and other well-known New England families. Dyer Lathrop, the father of Mrs. Stan­ford, was a merchant of Albany, New York. He was born in Bozrah, Conn., in 1788. His father, Jedediah Lathrop, Jr., served in the War of the Revolution in Wadsworth's Connecticut brigade. The first of the Lathrop ancestry in this country was the Rev. John Lathrop, who was born in Yorkshire, Eng­land, in 1584. From him Dyer Lathrop was of the seventh generation in direct descent. He was graduated from Cambridge in 1609, became the pastor of the first dissenting church of London, and emigrated to the New England colonies in the ship Griffin, arriving in Boston in September, 1634. He had church charges at Scituate and at Barn­stable, Mass., and died at Barnstable in 1653. His son, Judge Samuel Lathrop, was in the Narragansett war, and resided for many years in New London, Conn. Dyer Lathrop's wife was Jane Ann Shields. She was of Scottish descent, and her father, Daniel Shields, served during the Revolution in a regiment of New York troops. 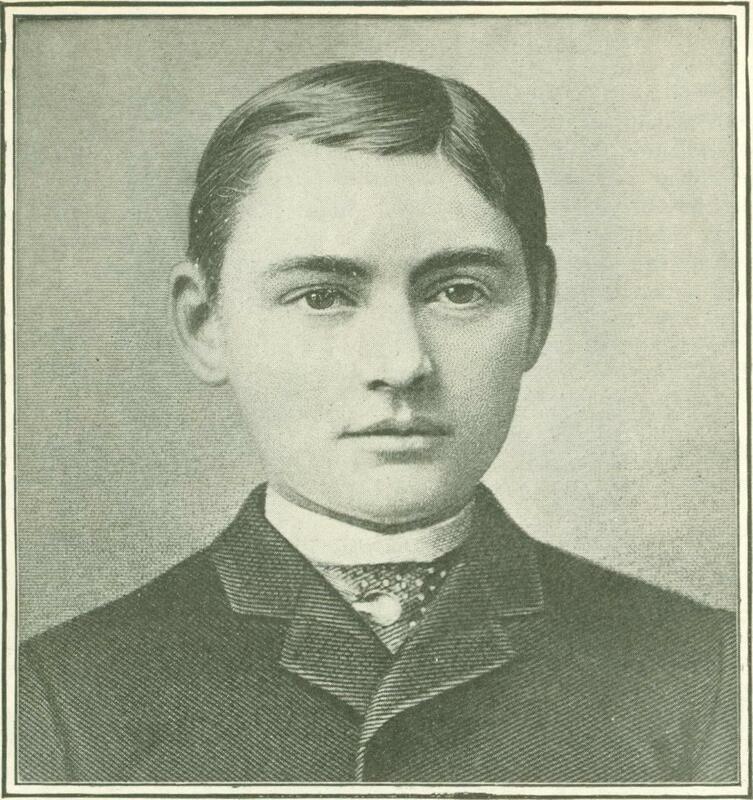 Jane Ann Lathrop (Stanford) was the third of Dyer Lathrop's seven children. She was born in Albany in 1829. The old Lathrop home is still standing, being devoted, by reason of her benefactions, to charitable purposes. Of the seven children, there sur­vive only Mrs. Stanford, Ariel Lathrop of Albany, and Charles G. Lathrop of San Francisco. Dyer Lathrop was well-to-do, and his children were all fairly well educated. 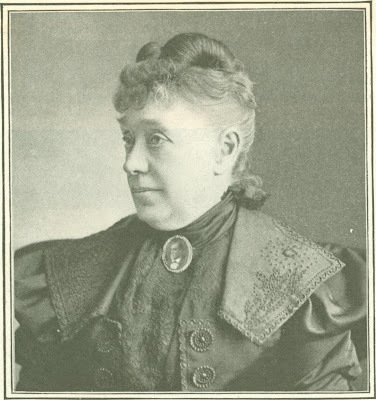 Mrs. Stanford concluded her schooling with a course at the Albany Girls' High School. "Never mind," said he, "a time will come when I will build a railroad for you to go home on." Sacramento, where Mrs. Stanford then made her home for many years, was the bustling capital of the young state. Business was humming and fortunes were quick­ly made and quickly lost. Gold mining was at its height, and Sacramento was the center of the rich districts of the Sierra foothills. With economical management at home and foresight and industry at the store, Mr. Stanford made money. Then he turned his attention to politics, helped to organize the Republican Party in the state, and at the next election vainly ran for state treasurer. In 1859, he was a candidate for governor. He was defeated, but was more successful in 1861, as the candidate of the Union party, and Mrs. Stanford suddenly found herself called upon to assume the onerous duties of the first lady of the state. She took up the task with enthusiasm, and the entertainments given in the mansion that Union made him a man of mark. Meanwhile the central overland railroad project had been talked of. It was dismissed as chimeri­cal by all except a half-dozen wide-awake Sacramento merchants. Of these enthusi­asts only Collis P. Huntington survives. None more ardently advocated the project than Stanford; none worked more tirelessly to push it to completion; to none did it bring greater rewards. He was a rich man when, on May 10, 1869, at Promontory, Utah, he drove the golden spike that joined the Central Pacific Railroad with the Union Pacific and bound the continent in bands of steel. After that his fortune grew many-fold. 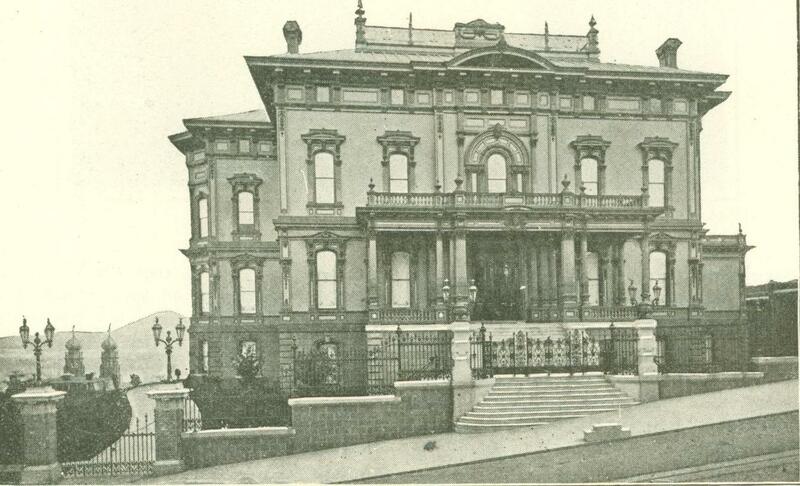 A fine residence on Nob Hill, San Francisco—that Jungfrau of bonanza kings and railroad millionaires--was built, and still stands in the lower part of the old city surpassed in splendor anything ever seen in the West. To this day, old-time politicians will tell stories of the luxury of living, with reminiscent remarks that begin with: "When Stanford was governor, I remember - "Those were happy days for Mrs. Stanford. No wonder that in her present loneliness she cherishes the old mansion in all the dinginess of past architectural glory, and promises herself, vaguely, that someday she will return, to pass her last days where once she found so much happiness. 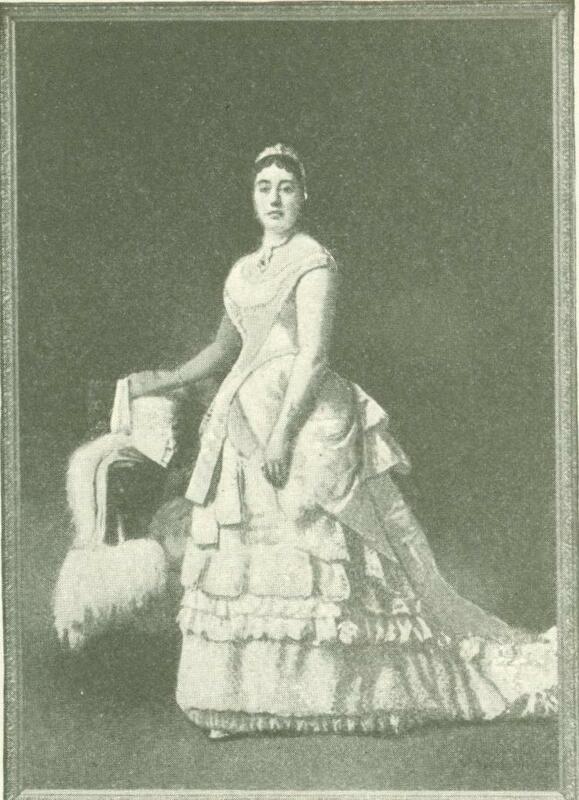 As governor during the Civil War her husband became of prominence and influence. President Lincoln was his friend. Great men in Congress praised him. His deter­mined stand in holding California for the Mrs. Stanford found herself in the giddy whirl of fashionable life. An incident of the fitting of the palatial mansion for some notable function is related to illustrate Mrs. Stanford's will and sense. A few days before the affair she called in a decorator and asked that a certain style of gilded molding, which was a feature of the drawing-room be put in the reception-room, adjoining. She asked that the work be done immediately. "Impossible," replied the artisan. "It would take two men at least six weeks to do that." "Then it's not at all impossible," re­sponded Mrs. Stanford, with quiet decision. "If two men can do it in six weeks, twelve men can do it in one week, and twenty-four men in three days. Please have twenty-four men here to-mor­row; the work must be done." The work was done, but for those three days it looked as though the dec­orators' union was holding a levee in the Stanford par­lors. In Sacramento on May 14, 1868, was born the son—their only child—who was thereafter the idol of both parents. He was a handsome, manly child, not over brilliant or un­duly precocious, but showing the inheri­tance of sturdy men­tal traits. The large Palo Alto estate thirty miles south of San Francisco was acquired as much as anything that the childhood of young Leland could be passed in the most healthful surroundings. To his care and training Mrs. Stanford devoted herself with the earnestness of anxious motherhood. Nurses and tutors and grooms, and everything that a child could have, fell to the lot of this heir of many millions. The bent toward the mechanical that the father had shown, early betrayed itself in the son. He liked to use his hands. He would carve, he would take apart machinery that he might put it to­gether. And back of the great house at Palo Alto is as mournful a reminder of a dead child as could ever be shown. A little railroad, with rails of real iron, built entirely by the lad's own la­bor, extends from the rear door of the house back into the orchard for about four hundred feet. On the track rests a car, dust-covered and falling in pieces, just where it was left by him who is gone—left as were the toy soldiers, when 'Gene Field's Little Boy Blue "Kissed them and put them there." In 1879, a tour abroad was made, partly for Mr. Stanford's health, partly for the son's education. Three years were passed in travel and study. At Nice a young Ameri­can of scholarly attainments, Mr. Herbert C. Nash, was serving as vice-consul. A tutor for young Leland was desired by the Stan-fords, who were then in Paris. Mr. Nash was sent for and was engaged as the boy's teacher and companion. Then began his connection with the family which is illustra­tive of the lasting friendships of the Stanfords. After the son's death, Mr. Nash be­came private secretary to Senator Stanford, and after the Senator's death he continued as confidential aid to Mrs. Stanford. At present he is secretary of the university trustees and librarian of the fast-increasing college library, his merit and faithfulness in all positions well illustrating Senator Stan­ford's rare capacity for judging men. In the various European capitals the Stanfords were widely entertained, and the adaptabil­ity of the American woman of Mrs. Stan­ford's ancestry and training were nowhere better shown than when she was thus called on to mingle with the old-world aristocracy. In May, 1883, there came a second trip abroad. In July Mrs. Stanford was ill in London for many weeks, and after her re­covery the son became ill. Fever resulted from which he never rallied, and he died in Florence, Italy, on March 13, 1884. The re­mains were brought home and buried under the spreading oaks at Palo Alto. On Thanks­giving Day, 1884, impressive services were held at which the late Bishop Newman de­livered the eulogy. A few years later the remains were transferred to a costly mauso­leum on the university grounds. Loyal to the friendships of her son, Mrs. Stanford has been helpful to many of his former associates. There was one playmate especially, a cripple, who was filled with wild longings to become a great artist. He was sent abroad and given a liberal allowance while studying for several years. He at­tained no small degree of recognition in his art, but died shortly after his return home. Plans for founding a great university in memory of their son were discussed and assumed shape rapidly. With the results the public is more or less familiar. No more enduring or far-reaching memorial could have been devised. On March 9, 1885, the Legislature of Cali­fornia passed an act providing for the administration of trust funds in connection with institutions of learning. On November 14, 1885, the grant of endowment was pub­licly made, and on the same day the board of trustees held its first meeting in San Francisco. The work of construction was begun at once, and the corner stone laid May 14, 1887, the nineteenth anniversary of the birth of young Stanford. The university was formally opened to students October 1, 1891. The idea of the university, in the words of its founders, "came directly and largely from our son and only child, Leland; and in the belief that had he been spared to advise as to the disposition of our estate, he would have desired the devotion of a large portion thereof to this purpose, we will that for all time to come the institution hereby founded shall bear his name, and shall be known as The Leland Stanford Junior University." The stated object of the university is to qualify students of both sexes for personal success and direct usefulness in life, and its purposes, as stated in its charter, are: "To promote the public welfare by exercising an influence in behalf of humanity and civili­zation, teaching the blessings of liberty regulated by law, and inculcating love and reverence for the great principles of govern­ment, as derived from the inalienable rights of man to life, liberty and the pursuit of happiness." 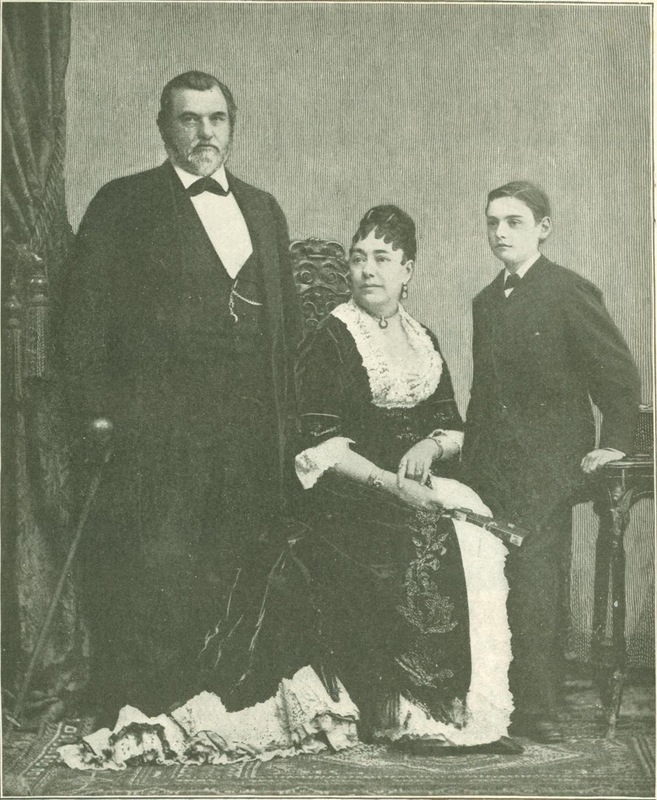 Mr. and Mrs. Leland Stanford and Leland Stanford, Jr.
By direction of Mrs. Stanford the number of women students in actual attendance has been limited to five hundred, her expressed reason for this limitation being her fear that if the number of women exceed the number of men the university would be re­garded by the public as a university for women instead of for men. "This was not my husband's wish," she said, "nor is it mine, nor would it have been my son's." 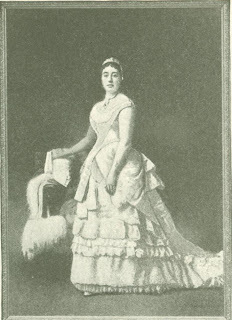 This limitation caused critics to say that Mrs. Stanford opposed the higher education of women. This is entirely contrary to the fact, the only reason for her recent action being as here stated. The original university endowment com­prised property worth between $6,000,000 and $7,000,000. It included the Palo Alto estate and famous stock farm, nearly 8,000 acres in all; the Vina Ranch of 55,000 acres with its vineyard of 2,860,000 vines - the largest vineyard in the world; and the Grid­ley wheat ranch of 21,000 acres. The latest gift of about $10,000.000 worth of property from Mrs. Stanford included stock of the Southern Pacific Company, valued at $2,000,­000, but which, if it reaches par, will be worth many times that amount. 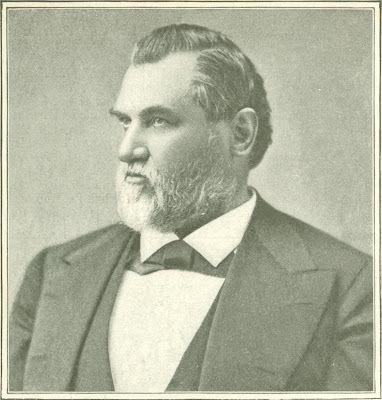 While carrying out the plans for the uni­versity in 1885, Mr. Stanford was elected United States Senator from California, and Mrs. Stanford for some years was in the midst of life at Washington. On June 20, 1893, Senator Stanford died at Palo Alto, while serving his second term in the Senate. By the terms of the university grant, the work of fulfilling the stupendous task begun fell upon Mrs. Stanford, the trustees having no care of details until the death of both grantors. Then came years of trial and busi­ness vexations, in overcoming which Mrs. Stanford has surprised herself as well as her friends. 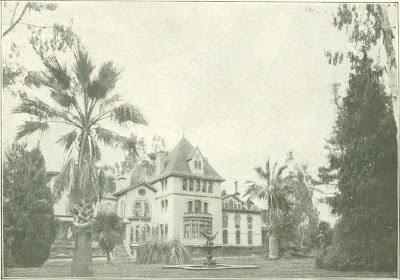 Securities dropped in value; the real estate endowment yielded irregular profits; the stock farm was an expensive luxury; the settlement of Senator Stanford's estate brought embarrassments; the univer­sity professors and the army of laborers on the ranches clamored for regular payments. It was a trying situation for a woman who had had no such cares, who was grief-strick­en, and was not in the best of health. But she surmounted all difficulties so well that last June she felt free to order herself a vacation, and went abroad for a six months' trip. 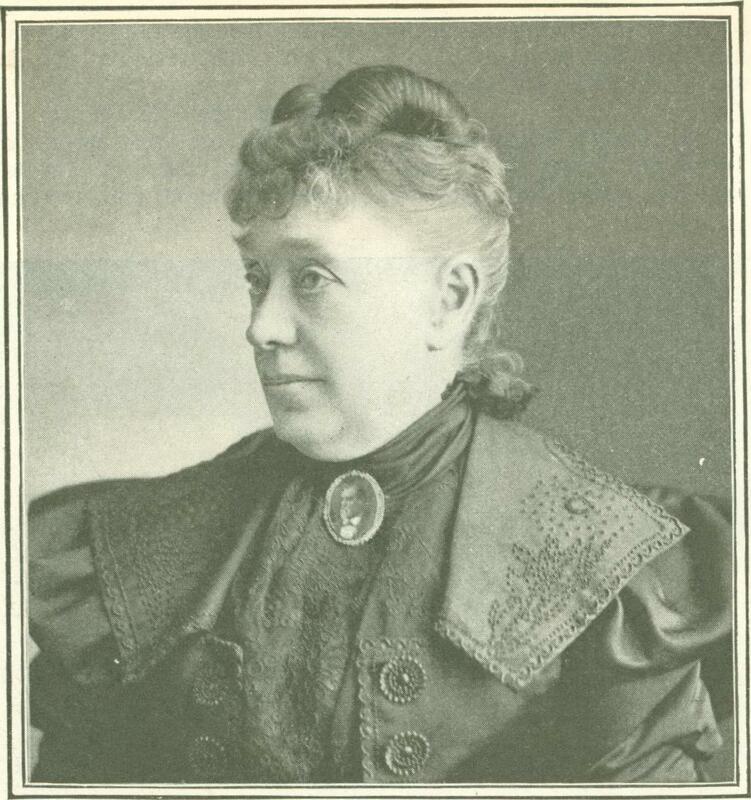 During this time of straightening affairs she was fortunate in having the help of her brother, Charles G. Lathrop, as business manager of the estate, and also in securing ready counsel in affairs educational from the university's president, Dr. David Starr Jordan. And so the university has grown and is waving branches in artistic beauty. Through the grounds and under the lofty arches a woman often rides alone. To her all students lift their hats in reverence and honor. She watches the scrimmages of cardinal-clad young men on the campus, and nods famil­iarly to young women in mortar-board hats. But her ride is both a pleasure and a pil­grimage. At the massive museum with its growing, joining with the older state uni­versity at Berkeley in giving to California educational advantages that older states may well envy. Stanford's low, tiled-roofed buildings are picturesque as well as substan­tial. Their lines recall those of the adobe missions with which a century ago Spain's roving monks dotted all the state. Against their gray walls olives and palms rear their front like the pillared Parthenon, the car­riage stops, and she ascends to a little room with steel door and heavy locks. And there, acne, she rests, thinking of the past, sur­rounded by the toys and playthings, pic­tures, carvings and works of art, all laid or hung upon the walls just as her boy hall once arranged them in his own room at home. From Ainslee’s Magazine, November 1899.